1. "This baby isn't that big"- Wow, how great would that be? She's thinking 8lbs something oz. That sounds great to me seeing as both Layton and Timber were over 9lbs. 2. "Your labor is going to go fast" - Really? Because Layton was 25 hours and then a c-section and Timber was 8 hours of labor with pitocin and then 2 hours of pushing. But her words were, "When you go into labor you need to make a b-line for the hospital." 3. "Your going to go into labor any day now." - Well, I guess if you considered the next 2 weeks "any day" then I'd say that's right. Maybe she was just trying to make me feel better. So here's our plan. My next appt is November 3rd. That's if I don't go into labor before then. And trust me, I'm praying that the next trip I make down there isn't for an appt! But, if I must, then on the 3rd we'll probably set up an induction for sometime around the 6th. Which is fine by me. I think that by November 6th I'll be ready to be induced if Mason hasn't decided to come on his own. I wonder if my little pregnancy ticker stops at "40 wks" or if it just keeps counting? If it keeps counting then it should also definitely say something like, "this mama is ready to have this baby," "baby, where are you?" "come out and play!" (no, that last one is what Layton says.) I have a strong feeling that I will wake up tomorrow just a tad bit more pregnant than I did today...with no labor in sight. At least I go to my midwife tomorrow. I'll update you all on Wednesday because by the time I get home from the trip, pick up my kids, get dinner ready, eat, drop the kids back off and Gavin and I head out to Bible Study I don't think I'll have time to update. I need labor vibes...or just prayers for a quickly coming one because this mama IS done. Um yes, 3 days to go. Although I won't see my midwife until Tuesday. I'm sure we'll chat then about what "the plan" is. We'll have to see how she feels about inducing me. I'd rather not be induced this time. Timber was an induction at 41wks. Although the thought of going into labor and then driving 2 hours to the hospital doesn't sound so appealing either! This handsome big brother who's in 7th grade already! Yikes! Time goes way too fast! Debi from DebiDesigns convo'd me today and let me know that one of my quilts is in the Etsy voter for this week! 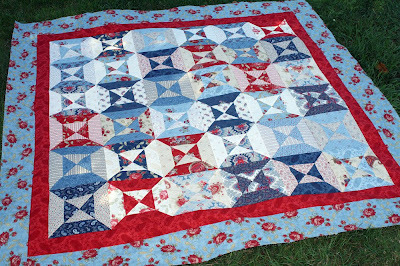 If you like the quilt, and get a chance, head on over and vote for it! :) Thanks! 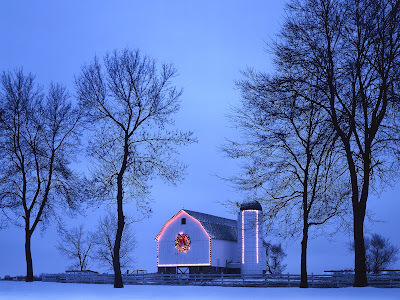 The first is a panel from the Flag Day Farm collection from Minick and Simpson. I bought it because it was on clearance but once I got it and opened it I was surprised at how perfect it would be for a table runner on my kitchen table. So, that's what it'll become. The other fabric is from the American Primer collection. I've had it before and loved it so I got some more. Here's the fabric from the Stitchin' Post for Mason's quilt. I love how it came in a jelly like roll of 4.5" fabric. That makes it possible for me to do something else than a patchwork quilt. Not quite sure what I'm going to do yet though. Any suggestions? MMMMMmmmmmm, the new Heather Ross Far, Far, Away fabric. It's ridiculously priced but I love it and just bought a little for quilt for Timber. American Jane overload. Building Blocks, Wee Play, Look and Learn, Peas and Carrots. 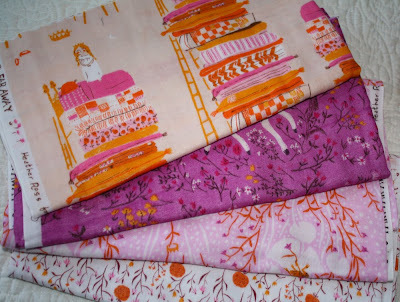 I can't get enough of Sandy Klopp's fabrics! Here's the stash in it's entirety. 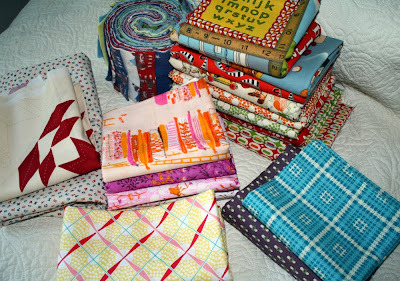 There's also some Moda 1974 in there for another quilt I'm working on and some Sweet for another quilt for Timber. 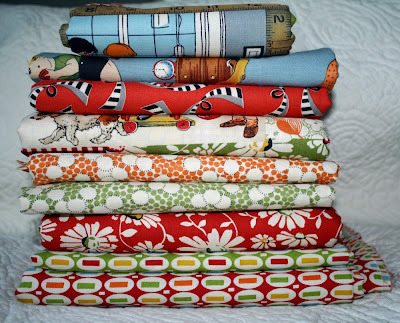 Have I ever said that I love, love, love, love, love fabric????? 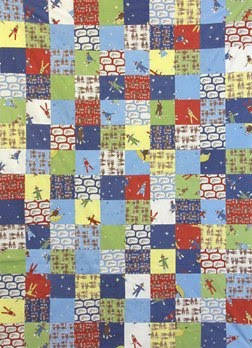 I'm still on the lookout for a little flannel fabric from the Goodnight Monkey collection (for some border fabric) but I found this the other day and ordered it! Thank you Stitchin' Post!! Also, I received my caramels that I talked about here and I am in awe!! Beth at Have It Sweet is AMAZING!!! (yes, that did require all capital letters because it's that good) She even sent a sample with my order of her chocolate caramels. So then I went ahead and ordered these and these and these. If you order any from her please be warned that you will be hooked and will never want to buy caramel from anywhere else......ever!!! Oh, and the caramels never made it to the muffins, they were gone long before I could actually whip up a batch. Does anyone have any of the Erin Michaels Goodnight Monkey fabric that they'd be willing to part with? Honestly, I'd love the flannel but I'd take the cotton too. It seems as though there is a shortage out there. I just spent about a half hour on Etsy, Ebay and Google trying to find some charm packs or layer cakes or whatever and the few and far between shops that had it were asking an arm and a leg for it! I guess I'm just too used to wholesale! Anyway, just thought I'd inquire of my readers to see if there's anyone out there with some extra. I'd like to use it on a quilt for Mason. TIA! What else can I do? I know that there are thousands of options out there. I certainly need a few things for the men folk. What are some handmade things that you'll be giving this year? What do a bunch of bush beans and being 38wks pregnant have in common? Um, absolutely nothing. I just would not recommend spending a half hour hunched over picking them while you're that pregnant. Not so fun. I doubt that Mason enjoyed being squished that much either. Note to self: next year, do pole beans exclusively. 1.Preheat oven to 350 degrees. In a medium bowl, whisk together flour, baking soda, cinnamon, nutmeg, and salt. In a shallow bowl, place 1/2 cup sugar; set aside. 2.With an electric mixer, beat butter and remaining cup of sugar until combined. Beat in egg and then molasses until combined. Reduce speed to low; gradually mix in dry ingredients, just until a dough forms. 3.Pinch off and roll dough into balls, each equal to 1 tablespoon. Roll balls in reserved sugar to coat. 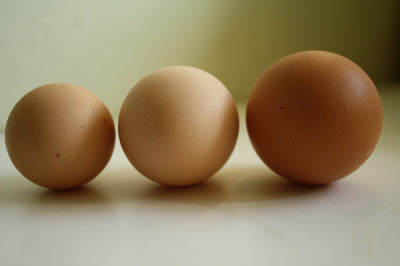 4.Arrange balls on baking sheets, about 3 inches apart. 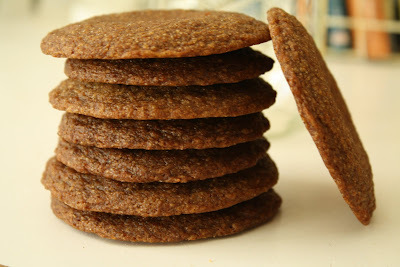 Bake, one sheet at a time, until edges of cookies are just firm, 10 to 15 minutes (cookies can be baked two sheets at a time, but they will not crackle uniformly). Cool 1 minute on baking sheets; transfer to racks to cool completely. Store in an airtight container up to 4 days. Finally! Our hens that were born this February just started laying eggs! I was hoping they'd start this Aug/Sept but I guess they're "late bloomeers." Anyway, we haven't had chicks in so long that I forgot how small their first eggs are. 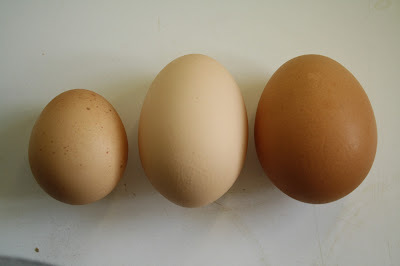 Here's a shot of (from left to right) one of the babies eggs, one of our "normal" eggs and then an egg from a local dairy that raises Red Sexlinks. Um, those eggs are huge! 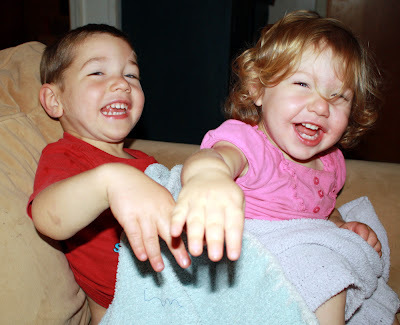 And here's how my kids feel about all this silly chicken/egg talk! 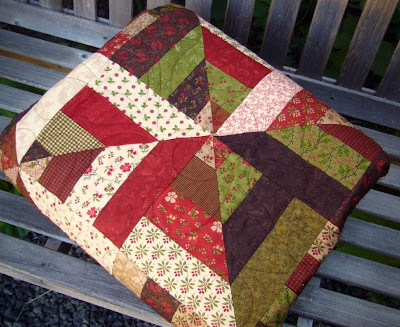 Oh I love any of the Green Fairy quilt patterns, but the other one is beautiful, too. I'd love to win one!" I love that 2nd pattern!" Isn't that weird how that worked out? It must have been meant to be! Congrats Deb! If you can send me your info I'll get you the Green Fairy Quilts Pattern! Thanks to everyone else who entered. I'll have another giveaway before the end of the year so make sure that you check back in! I bought this for my children the other day and today in the mail- there it was! Both of my little ones love it and I have to say that I am SUPER impressed with Margaret's work. These things are perfect!! She has done an amazing job crafting them! 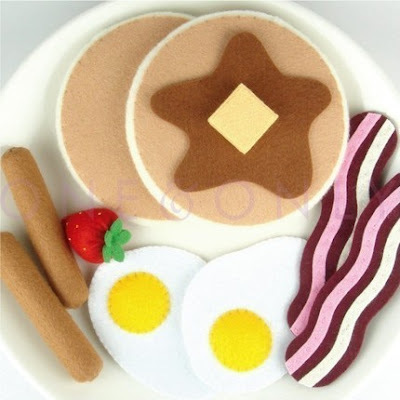 Now I only wish she did an extensive line of felt food because I would buy her out! :) Here's her shop link to view other items. 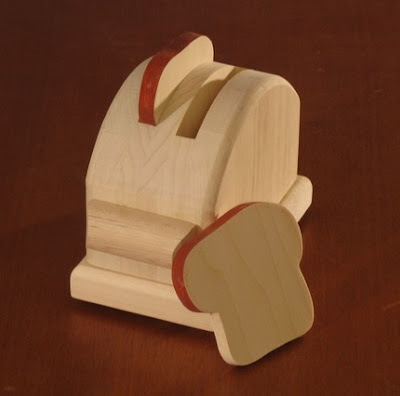 I'm hoping to buy the kids a wooden kitchen for their Christmas present and this toaster would compliment it perfectly! The pattern giveaway on my blog ends tonight! 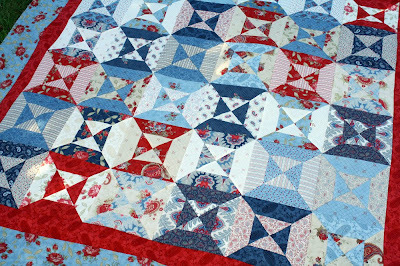 Make sure you've entered for your chance to win one of the fabulous quilt patterns! Pride is not something you're supposed to be full of. It's not a Godly thing. But ya know, sometimes you need to have some pride. And in my opinion, one of the things that you can have pride in is your work. Now I'm no "super quilter." You don't see me creating masterpieces that win world wide quilt shows. Moda isn't seeking me out to design their fabrics. Quilt magazines aren't contacting me to design patterns. But, I do take pride in my work. If I make something that I personally feel is "less than adequate" I chalk it up to, "don't make one of those again" and then sell the quilt as a second with the full disclosure of what I felt was flawed. 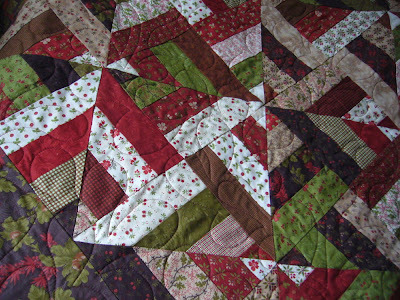 There are folks out there that may look at the quilt and think, "Flawed? Um, it looks good to me." But we quilters know. We can tell. It's important to be honest about the things that you sell; the things that people are spending their hard earned money on. Where am I going with this? Well, no where really. I just wanted to let you know how I felt. 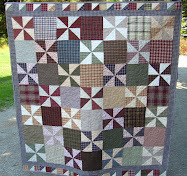 I guess it was part brought on by a quilt that I purchased and part brought on by the blocks that I won from Cathy. I was super impressed by her sewing. The blocks were gorgeous. I haven't seen, in person, one of her finished quilts but I would be willing to bet my hard earned dollar that they are lovely and well made. You can see her finished quilts here and below is the finished quilt top from the blocks that she so graciously gave away. Well, that's what my pregnancy ticker says at least. I don't think it's really hit me that in less than 3 weeks I'm going to have another little one here in the house. It also still hasn't hit me that this may very well be my last pregnancy. I've pretty much been pregnant or nursing since 2005, so it does feel a little funny to think that I may not be pregnant EVER again. But I am SO excited for Mason to be here- I wish it was today........except for all the sewing I still need to do. Today I'm canning pears (maybe green beans too) and hopefully I'll get some more sewing done. I think late nights with my machine are in my future. Mason's quilt is not done. Um, not even close. I still have to finish up my Christmas quilt for the shop. I have 2 quilt tops that are almost ready to be quilted- they just need the backing and batting cut out first. A Christmas present quilt who's top is almost done. 5 more aprons to make. More Yo-yo garland to sew since the last one sold in just 2 days. And all to be done in less than 20 days! I guess I'd better get to sewing and off this computer! 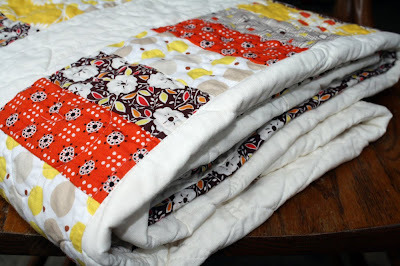 I added a new quilt to the shop this morning and it is so cute! I also started work on a new Christmas quilt using Deb Strains "Winter Song" fabric collection. It is turning out so gorgeous that I'm sort of secretly hoping no one buys it from the shop so that I can just keep it! (Those quilts are always the ones that sell the next day after listing them!) I could always buy more fabric and make another one for myself but I personally just have something against making the same quilt twice. 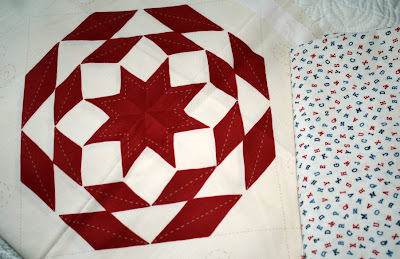 I'm also working on a top with some blocks that I won from Cathy's blog. Luckily I have some extra fabric from the same collection on hand here at the house. Why all the quilting all of a sudden? Well, Gavin is gone hunting! :) I don't know why, but that seems to free up some more of my time! Tee hee. 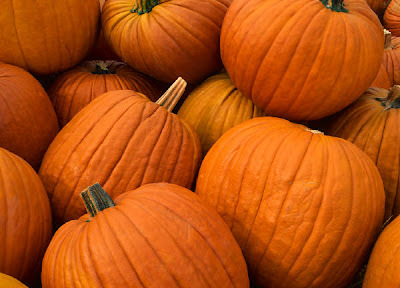 Already October! Where does the time go? Again, I'm slightly behind seeing as today is the 3rd and it just hit me that I didn't assign a quilt for Quilt of the Month! So here we go. 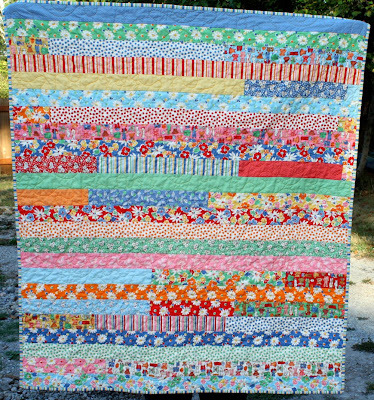 Katie Jump Rope fabric made up into one super cool quilt. Here's the listing if you'd like the info on what Quilt of the Month is all about. Enjoy!